Giovanna is the very hard-working international export manager of Fausti and Fausti USA. Actually, I have a lot in common with Giovanna. She speaks something like eighty-seven languages; I struggle with one but aspire to become more fluent in American slang, at least. Both Giovanna and Barbara are intimately and actively involved with Fausti operations on a daily basis, as is their sister Elena. It is the Fausti commitment to first quality steel, walnut, and modern manufacturing techniques that allows them to offer unique, properly scaled smaller bore doubles not available elsewhere. The Fausti name is one that most shotgun aficionados are aware of, but don't seem to have any consistent feelings about in the United States. There is a good reason for that. When a company such as Fausti produces product for importers and companies that just apply their brand name to things, their role is as an OEM. Whether you quote shock absorbers for automobiles, speakers for home theaters, engines for garden tractors, or riflescopes for that matter the system of procurement is closely aligned. The importer or marketer goes out for bids on the job, with the purchaser setting the price points, the specifications, and so forth. The resultant quality is variable, but the actual manufacturer has little control over that. Whether it is refrigerator or a furnace, the importer or distributor sets the specifications and the vendor most build to those parameters and do so economically. For this basic reason, no direct comparison can be made between models even though the sourced manufacturer may be the same. What Fausti USA is doing is taking direct control of their own brand for the first time in the United States. It means that Fausti USA product have features and standards of build quality that they choose, no one else. So, why buy a Fausti? What has Fausti USA got that is unique, appealing, and not available elsewhere? 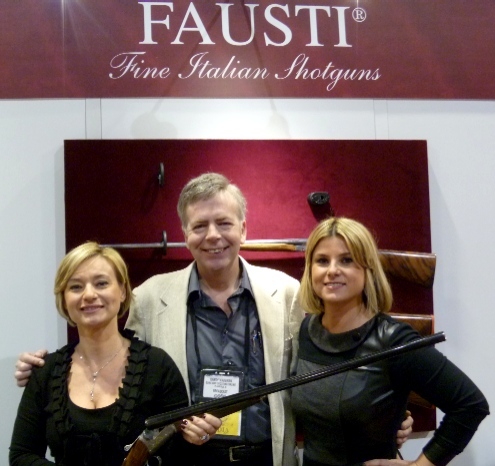 The Fausti USA line consists of two basic categories, SxS and O/U models. There are scant few side-by-side shotguns available today that are both high quality, affordable, and have scaled frames in the smaller bores. Rather than take an O/U action style and try to make it into a double, Fausti USA adheres to the British format of the side-by-side, using no cast parts, but using modern manufacturing methods. Fausti USA side-by-sides are presented as their modified Anson & Deeley action. The Anson and Deeley boxlock action's heritage dates back to 1875, when it was developed from the prior Westly-Richards action by two Westly-Richards gun designers, by names of William Anson and John Deeley. No coincidence there. The seminal A & D action obsoleted exposed hammer guns, quickly gaining a reputation for simplicity and rugged durability, There are only three basic parts to the A & D action: the hammer, the sear, and the cocking dog. Fausti USA side-by-sides feature hard chrome-lined barrels, interchangeable forearms and stocks, and properly sized and scaled receivers. The result of this is what sets apart the English style game gun from the rest: balance and handling. The interchangeability of parts is now possible due to improved machining tolerances, not available in the late 1800s at all, a fairly recent development. Fausti USA doubles also have lengthened forcing cones and the metallurgy employed today, chrome-moly steel, didn't exist in yesteryear, not did the close tolerances and interchangeable parts. Automatic ejectors, rather than just extractors, are used. Box locks are considered the most rugged of the doubles, as less wood needs to be removed from the front of the buttstock. A close-up view of the underside of the Fausti USA Caledon SL O/U shotgun. The Fausti USA O/U shotguns are built upon the well-known Italian build action, low-profile and pleasing to the eye. You can expect silver brazed ribs as opposed to the soft-solder attempt, a receiver made from solid billet of steel, with the focus again on durability, responsiveness, and good looks. The Faust Class twenty gauge I'm working with right now weighs 6 lbs, 6 ounces, with consistent clean-breaking triggers that release at 4 lb. 4 oz. and 4 lb. 10 ounces respectively. This is night and day from the generic, cheap genre of essentially unfinished vertical doubles that are junk-level guns by comparison, lacking the surface finishes, wood quality, and precise wood to metal fit that makes an O/U shotgun worth owning in the first place. The properly scaled 16 gauge is hard to find, but Fausti USA offers it. The Fausti Boutique is the Fausti program where now you can order a true custom gun, built to your own specifications, an opportunity simply not available from several major manufacturers in any affordable or reasonable sense. The Fausti USA line currently ranges from the well-executed, well-balanced lines of shotguns to the heirloom, custom-crafted heirloom grade with engraving that can be considered high art. As far as I'm concerned, the purpose of a shotgun is a simple one: to enjoy it. The enjoyment of a shotgun is hardly limited to just making noise, lots of things do that . . . like jackhammers. One of the most comical, inane quotes about shotguns is that they mean three things: Boom, boom, boom. Though goofy statements like that may hold some some weird appeal to the secret, mindless neanderthal hidden in all of us, it is also offensive to the delicate sensibilities of those with a bit more appreciation for shotguns. You enjoy a shotgun by the way it looks, the way it shoulders, the way it swings, the way it carries, the way it compliments you and your intended usage. Though I confess to generally liking all firearms, those that have a higher standard of build quality, attention to detail, balance, dashing good looks, and pointability are those that enhance the hunting and shooting experience the most. Fausti USA is now offering that level of shotgun, the level of shotgun that is the only one that inspires pride of ownership and has timeless appeal and value. Expect full-fledged reviews of Fausti USA product in the near future, when the remnants of this year's blizzards have subsided a bit, and the morning temperatures rise a bit above the recent -14 degrees F.
For more info in the meantime, see new Fausti USA website.